I'm using a Samsung NP530U3C notebook (Core i3 3217U, HD Graphics 4000) with 10.2-RELEASE/GENERIC. After booting the system, display brightness is ca. at 80%, when pulling the power cable and relying on battery it is somewhat around 20% I suppose. Any advice would be much appreciated. Many thanks in advance. Do the Fn keys produce any event? Try running xev from a terminal, then press the buttons and check if you can see anything in the terminal. If you do, you can make the keys run some script which sets display brightness via sysctl and sudo. For all other F*-keys pressed in combination with fn key or the fn key pressed solely nothing happens in xev. IIRC the fn keys for brightness did work once when I had installed KDE, but now I'm using XFCE4. 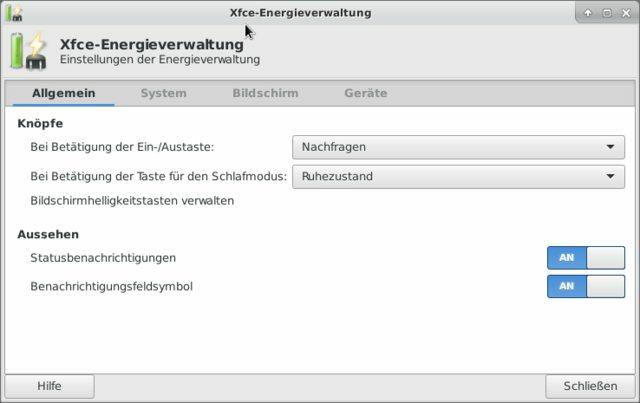 In KDE I had the opportunity to change the display brightness via GUI panels, but XFCE doesn't give me an option for this even though I've installed the according panels/plugins (i.e. intel_backlight, xfce-power-manager). Update: nvm, the fn+F-keys for brightness aren't working regardless of the DE. Thanks, but I think I'll go with graphics/intel-backlight and trying to map it some keys via x11/xbindkeys. Unfortunately this doesn't work. FreeBSD doesn't recognize my fn-key (except for in combination with F6/F7 for Vol+/-). Whether xev nor xbindkeys -k return something when pressing fn-key + F2/F3 which should be for brightness incr and decr. xev returns a keycode, but xbindkeys -k returns nothing. Next issue is that when I use intel_backlight as $ it gives me an error about the PCI device (? ), but when I run it as # it works like a charm.